Today, we look at abstract art and are totally unconcerned that it rarely has a subject. We don’t even expect it. But historically, paintings were “pictures of something,” a church, a river, a person, or a group of people. In fact, the most favored paintings at the Salon were expected to show famous historical or mythological scenes. Landscapes were much less important to them, and it had to have a focal point—one thing that is the center of attention. The focal point was prominently positioned, a brighter color, or larger than other elements. In other words, it was obvious what the artist wanted you to look at. This large painting (34.2” x 45.2”) by Pissarro was exhibited in the Salon of 1868, where reportedly it was hung too high to be seen properly. But the critic could see it well enough to determine that it has no focal point. In the lower foreground, two women dressed in fashionable dresses are seen on the path. In a painting by Monet or Renoir, they would probably be the focal point, but Pissarro makes them so small, we cannot even see their faces or distinguish any details of their dresses. Additionally, they are dwarfed by the tall trees directly behind them. Just left of the women is a group of houses, but they do not provide a focal point. They derive their importance only by their proximity to each other. They are fashioned with few brush strokes, and get their only sense of depth from the roof lines. The right side is dominated by a large dark wedge; it is impossible to distinguish bushes or trees in the tangle of dark green brushstrokes. The curved lines of the fields are the only clues that there is a deep valley between distant horizon line and the women. The fields are painted in broad swaths of color that flatten the background and make them look closer than they would in reality. 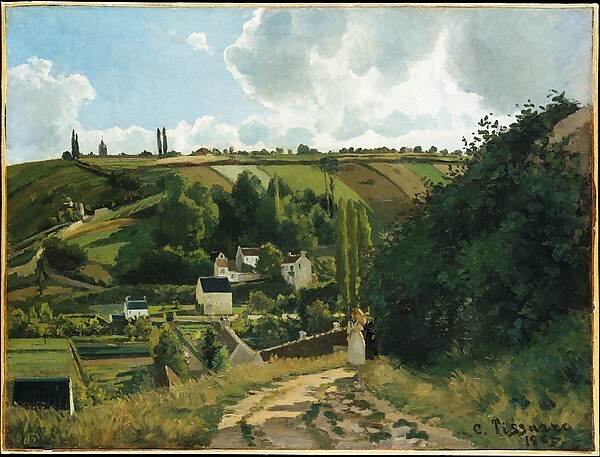 Pissarro, who had already proven himself to be proficient in painting accurate perspective, has chosen to flatten out this landscape. He never intended to make a perfect photographic replica, as the Realistic painters did. He was painting a composition of different colors and shapes set side-by-side. He simply used the real motif as a spark for his own personal sensation. No one would call this an abstract painting—too much is recognizable, but the flatness of the painting and the broad swathes of color are abstract elements. But radical for its time—yes, indeed. And this was seven years before the first Impressionist Exhibition. 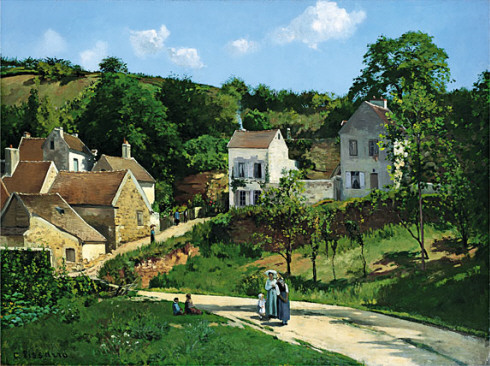 Pissarro was using artistic techniques that were different from all other artists before that time and those who were his friends. Much of the information in this article is from Pissarro:Critical Catalogue, Joachim Pissarro and Claire Durand-Ruel Snollaerts (2005). Why Did Pissarro Do This? Always pushing the edge of creativity and inventiveness, Pissarro painted The Hills at L’Hermitage, Pontoise in 1867, seven years before the first Impressionist Exhibition. But it demonstrates all the elements of Impressionism—the light palette, a scene of everyday life, and depiction of the weather. It is the largest painting ever made by Pissarro. Paul Durand-Ruel, his agent, bought the painting in March 1873 and sold it the same day to Jean-Baptiste Faure, a famous operatic baritone who sang in Paris and London. The people in Pissarro’s paintings are integral to its composition, but they are not there to tell a story. In fact, they often raise questions that have no answers. In this painting, a woman and little girl are talking to another woman. Most scholars agree that they are in fact Julie, the painter’s wife, and his daughter Minette. They are talking to a woman whose back is towards us, but we can see from her arms clasped behind her back that she has dark skin. This is especially noticeable because the skin of Julie and Minette are very light, almost pink. Who is this dark-skinned woman? Is she an African or a gypsy woman? What is the conversation between these two women from obviously different backgrounds? As provocative as this question may be, the women are just two small elements in the painting. The difference in skin-color is so subtle that it goes unnoticed by many viewers. When you remember that everything in a painting is due to the artist’s choice, you wonder why Pissarro raised this unanswerable question.